Dental health is very important when it comes to our cats and dogs. A lot of us know the phrase “dog breath” all too well. Cats are no exemption to that; it can get stinky in there. The good news is that it doesn’t have to be that way - and it shouldn’t. Unfortunately, our pets can’t brush their own teeth but it doesn’t mean they don’t require dental care. In fact, by the age of 3, 70% of cats and 80% of dogs have some form of periodontal disease (dental disease). This means plaque and tartar build up, inflamed gums, and risk of even more serious health problems. When the build-up of tartar on our pets' teeth accumulates on or near the gum line, the bacteria penetrate through and into the bloodstream. There is documented correlation between dental disease and heart disease. This harmful bacteria can flow through the bloodstream and into the heart. Long term, this bacteria can cause endocarditis, an inflammation of the heart’s valves or inner lining. While this bacteria can be hard on the heart, it is also very taxing on the filtering organs of the body, the liver, and kidneys. Dental health plays a big role in overall health and prevention is key! The dogs with the least offensive breath are typically fed a raw diet, get some chewing time on raw meaty bones, or have regular dental sticks. Most dogs have a natural drive to chew on things which provides beneficial teeth scraping. It is also important for our dogs to get the mental stimulation of chewing. Dogs' mouths are able to chew on larger raw femur and knuckle bones. With cats it’s a little different, they don’t really chew on things for extended periods of time. Their teeth are designed only to bite and tear into meat and crunch smaller bones. Raw chicken necks are the perfect item for maintaining dental health in cats. My cat will toss the raw chicken neck from side to side in the back of her mouth snapping right through the bones. It can take her anywhere from 5 - 15 minutes for her to eat the whole thing. Raw bones are very safe. If the bones are size appropriate and RAW your pet has a lot to gain from having them as part of their regular diet. The beneficial teeth scraping that chewing it provides is very important for both dogs and cats, but it’s not the only preventative measure. Dietary probiotics and enzymes make a big difference as well. Sometimes people will tell me that their dog's teeth are clean but their breath still is awful. When this happens I look to the gut as it’s all a part of oral health! Digestion of starches begins in the mouth for humans but our cats and dogs lack the enzyme, Amylase, to break down sugars (starches) in their mouths and stomachs. An imbalance of gut bacteria and lingering breakdown of food can create an odor which can come out through the mouth and sometimes the skin, paws or ears. Providing digestive supplements to help their bodies breakdown food will help to remove the smell and help slow down plaque and tartar build up in the future. Providing a species appropriate diet is also very important, this means a diet fit for the oral structure and digestive system of the pet. Unfortunately, the dry kibble foods do not provide any dental benefits. This is a common misconception that the scraping of the food helps the teeth. While it may seem like your pets are chewing their food the fact is the majority of it gets swallowed whole and, sadly, what does get chewed has now created a nice starchy (sugary) base for tartar build up. I always give the comparison of humans eating potato chips instead of brushing our teeth and not one person wants to give that a try. So just as we brush our own teeth at the beginning and end of every day we should think about our pets. Even if their dry food is a very high-quality one, we can help by brushing their teeth just like ours. 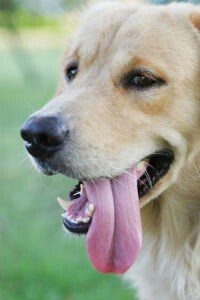 Pet dental health is extremely important for more reasons than just avoiding the dreaded “dog breath”. It’s important so that our pets can live their happiest, healthiest life. If you have questions about how to support your pet's dental health and are looking for recommendations on the best diet promote a healthy mouth and teeth, stop into the store and we'll be happy to help! What about water additives? Or dental sprays? Are there any that you could recommend?